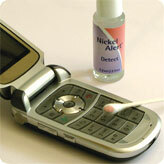 As a nickel allergy sufferer, my personal recommendation is to get rid of as many nickel items as you possibly can. If you have them around you will inevitably come into contact with them. However, if you feel the need to keep them, my recommendations are here. 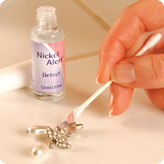 One often recommended method for dealing with nickel jewelry is to coat it with some kind of barrier. You can easily buy “hypoallergenic” brush-on varnishes – seems to be nothing more than nail varnish to me. This can help BUT it wears off and you’re back to square one. And worse you may not immediately realise it’s worn off until you break out again. Yes, you guessed it, I don’t recommend coating. If you need to do it, be careful to re-coat regularly. When I’m using tools – doing d-i-y around the house, I always use gloves. It’s basically impossible to buy a full set of tools with no nickel content. At minimum, the business end (eg drill bits, blades, etc) can be alloyed with nickel for hardness. I have found the best option to be gloves (see my section on gloves). For rougher jobs I put work gloves over nitrile gloves. That way I don’t tear the nitrile gloves and I can pop the work gloves on and off as needed but still be protected. 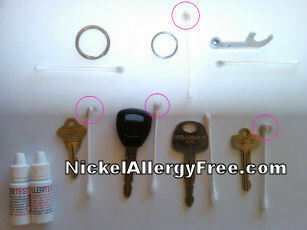 ReplacingReplacing nickel items is the best route – take a nickel test kit with you when shopping for replacements! The toughest problem can be jewelry like a wedding ring which starts to become a problem for you. Quite likely you and your husband spent some time choosing it and it’s special in so many ways. Since this ring is connected so intimately to your marriage it can feel very wrong to give it up even if it is causing you discomfort. Obviously, you need to find the path which makes most sense to you but one suggestion (thanks to my visitors for this idea) – is to re-bless the ring. It doesn’t need to be a big ceremonious re-do – and this can be kind of fun to do just the two of you – to go back to where you originally got married and have a new (nickel-free!) ring re-blessed. Nikon have a range of “guaranteed nickel free” spectacle frames which are at the high end of the standard mall/high street price range (ie not overpriced designer $$$$). I personally use a pair of Nikon titanium frames which Nikon guaranteed to be 100% nickel-free and have had no trouble with them. Ask your optician for them. I’m looking for more manufacturers with nickel free frames and a useful buyers guide to their products…. please let me know if you find any others to add to this list. There is a lot of advice I have read which makes broad statements such as “titanium does not have nickel in it”. Unfortunately this advice can be plain wrong – for example titanium spectacle frames may be alloyed with another metal such as nickel or copper. You need to be sure it’s either 100% titanium or at least 100% nickel-free (ie possibly alloyed with another metal). Many frames which are alloyed with nickel are coated with a nickel-free coating. This is great until it wears off. If you change your glasses every few months, this could work for you. If like many of us you only change them every 1-3 years this route could cause you serious problems (as it did me). Common items which often contain nickel and which we touch on a regular basis include spectacles, zippers, belt buckles, watches, jeans buttons. Aside from nickel items which you may be wearing, look for thing in your home which contain nickel (use a nickel test kit around the house)… it may not be practical to replace everything but at least you know what to avoid. Test metal catches, handles, trim etc. If you have a nickel allergy, make it a priority to replace the items you touch the most – for example if you wear spectacles all day and you find that yours have a measurable nickel content, put them at the top of your list since they are touching your skin so much of the time. Follow the menu links to the left for nickel-free spectacle frames, nickel-free belts, nickel-free belt buckes, nickel-free jewelry, nickel-free watches and more.